The smartphone design has matured in the last few years, leaving limited scope for innovation. So, a Chinese smartphone vendor has taken inspiration (or copied?) from Apple’s iPhone X and Samsung’s upcoming Galaxy S9. Doogee has posted a video of its upcoming phone Doogee V, which is a nice blend of the iPhone X and Galaxy S9. The handset also has something new to offer: an in-display fingerprint sensor. Noted tipster Evan Blass also shared a picture of the Doogee V. The Chinese company is expected to officially unveil the device at the Consumer Electronics Show (CES) in Las Vegas. While it’s not uncommon for smartphone vendors to borrow a few design elements from one another from time to time, sometimes Chinese vendors go beyond all the barriers of copying other phones’ designs shamelessly. If you have seen the iPhone X, or at least a photo or video of it, you’ll find the Doogee V familiar. According to Evan Blass, it has a 6.2-inch display with Full HD resolution. The phone has minimal bezels and rounded corners similar to the iPhone X. It also has a top ‘notch’ that houses the front camera, ear speaker, and other sensors. Apple executives would find the Doogee V’s notch amusing. The iPhone X’s top notch had received a mix response from consumers and critics. The iPhone X’s notch accommodates the TrueDepth camera that supports FaceID and Animoji features. Bezel-less screens have become pretty common for Android phones. But the Doogee V’s screen curves on the sides similar to Samsung’s Galaxy S8 and the upcoming Galaxy S9. The Galaxy S9 pictures have leaked many times over the last few months, and they seem to have influenced the Doogee V design heavily. Its rear panel is made out of glass. The phone has a vertically arranged dual camera system on the back, similar to the leaked images of the Galaxy S9 Plus. According to Benjamin Geskin, the rear panel would have two 21-megapixel camera sensors. The Doogee V will also have dual 16-megapixel sensors on the front. Geskin claims it would offer 6GB RAM and 128GB of internal storage. Set to launch in April or May, the device would cost you between $300 and $350. The Doogee V also has a 3.5mm headphone jack, a speaker grille, and a USB Type-C port at the bottom. The power button and volume rockers are placed on the right side. Will Doogee V beat Vivo in optical fingerprint sensor race? The biggest highlight of the Doogee V is the in-display fingerprint reader. It has become one of the world’s first phones to bring the technology. Samsung has been struggling for years to incorporate the optical fingerprint scanner into its flagship phones. The Korean company is finally expected to introduce the technology with the Galaxy Note 9 later this year. The in-display fingerprint scanner would allow Doogee V users to unlock the phone by placing their finger on the screen. The Galaxy S9 and S9 Plus will have the fingerprint scanner on the back panel, below the camera module. A big question is whether Doogee V will get things right with the optical fingerprint technology. Samsung has faced several issues ranging from speed to security to low yield rates. 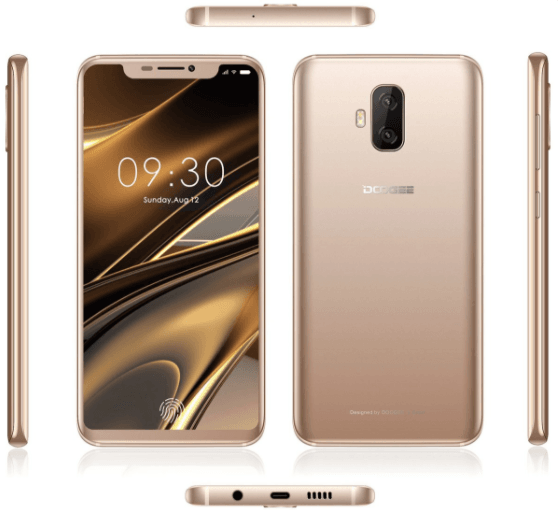 It is also not clear which company would supply the on-screen fingerprint sensors for the Doogee V. An in-display fingerprint scanner would be far more convenient than the rear-mounted one. Last month, Synaptics told media that it had started mass production of its ClearID FS9500 in-display fingerprint sensors that could be used in Android phones this year. Vivo, another Chinese company, has also teased the on-screen fingerprint sensor. Vivo is expected to announce its phone with the new technology at the CES. Vivo will likely source the optical fingerprint scanners from Synaptics. Synaptics has announced that it had teamed up with one of the world’s top five smartphone vendors to bring ClearID FS9500 to the market. Vivo’s parent company BBK Electronics is among the world’s top five vendors.